History - In Ancient Greek, fennel was called marathon. This is the origin of the placename Marathon (meaning place of fennel), site of the Battle of Marathon in 490 BC. Greek Mythology claims Prometheus used the stalk of a fennel plant to steal fire from the gods. 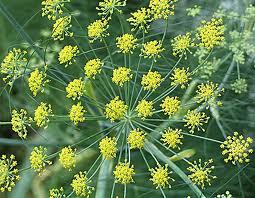 In medieval times fennel was used in conjunction with St Johns Wort to keep away witchcraft and other evil things. This might have originated because fennel can be used as an insect repellant. Effects on the Mind - Encourages the ability to see a situation clearly. Induces courage, strength and hope in the face of seemingly impossible hurdles. Effects on the Body - A excellent cleanser and detoxifier for the body, especially after over-indulging in food and alcohol. Excellent for the digestive system, relieving constipation, flatulence and nausea. An invaluable aid for slimming, curbing the appetite yet increasing energy levels. Blends Well With - Geranium, Gernaium Rose, Lavender, Rose, and Sandalwood. Cautions - Do not apply this oil directly to the skin without being diluted in a carrier oil first. DO NOT use bitter fennel. Do not use excessively on young children or epileptics.